A summary on Black Elk Speaks discusses the book, written by John G. Neihardt, on an interview of the Oglala Medicine Man Black Elk in 1930. 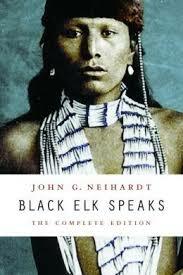 Black Elk Speaks is a 1932 book written by John G. Neihardt, who interviewed the Oglala Medicine Man Black Elk in 1930. Black Elk, who only spoke Lakota, used his son Ben Black Elk, as his translator, and Neihardt took copious notes during the interviews, later compiling them into the book. Since its original publication, Black Elk Speaks has received critical acclaim. Central to the story is Black Elk’s first vision, which he had when he was nine years old. Black Elk described a journey to a cloud world in the sky, where the six grandfathers gave him sacred objects which would allow him to maintain the sacred hoop of the Lakota. It was with this vision that Black Elk knew he was different that the other Lakota, but a difference that brought great responsibility as well. Black Elk also discussed the increasing hostility between the Lakota the United States, and Black Elk recounts key details from the Battle of Little Big Horn, where the Lakota and Cheyenne defeated Custer’s 7th Cavalry. Eventually, Black Elk begins to question his vision, as it does not seem possible for him to be able to save his people. After the death of Crazy Horse, in 1877, Black Elk and several others fled to Canada. Later, Black Elk describes his time with Buffalo Bill Cody’s Wild West Show, traveling to Chicago, New York, and Europe. In Paris, he has a new vision, and returns home only to suffer the massacre at Wounded Knee and the assassination of Sitting Bull in 1890. In the end, Black Elk is disappointed and believes his was never able to use the powers granted in his vision. Way of Life for Native Americans - Way of Life for Native Americans Research Papers evaulates life before Europeans arrived. Pueblo Indians of New Mexico - Research papers on the Pueblo Indians of New Mexico delve into the different tribes of pueblos along with different attributes that are common among the different tribes. The Indian Removal Act - The Indian Removal Act research papers discuss the act signed by Andrew Jackson that forcibly removed the Five Civilized Tribes from their land west of the Mississippi. Dawes Act - Dawes Act research papers discuss the Act that authorized the President of the United States to survey and divide Native American lands for individuals. How Native American Gender Roles have Evolved - How Native American Gender Roles have Evolved Research Paper discusses the updated gender roles. Trail of Tears - Trail of Tears Research Papers examine one of the darkest acts in American history. Lakota Woman Summary - An essay on a Lakota Woman summary examines the story of Mary “Brave Woman” Crow Dog, and the author’s struggle with her mixed-raced identity in a culture that places an extraordinary value on pure Native American blood. Paper Masters writes custom research papers on Black Elk Speaks Summary and discuss the book, written by John G. Neihardt, on an interview of the Oglala Medicine Man Black Elk in 1930.